LOL or ALOL…I should say I’m too old for crushes, I mean I’m not that old but still I always had these on someone or the other at school, college, friends place, neighbours, workplace or simply at a bus-stop or in office-cabs (there come’s Mr.Cuteguy’s stop, I suddenly wake up from my nap and am all eyes ogling and drooling)…later I think what a bozo I am…but they are such delicate moments of pleasure and yes the heart breaks too when we find they are engaged or sometimes dumbos or jus not worth your feelings…loved your comic strip, its hilarious. *chuckle* too true man. too true. Now now.. atleast I know where all this is emanating from 🙂 Dont you koke.. those countless hours you spent wondering whats going in her head.. only to realise that you are screwing with ur head and heart ..
what fun times .. i have had listening to your stories..
With regards to your flickr account – like I said, the macro shots are stunning! The color composition is simply brilliant! Anu! First of all, I am thrilled that you left a comment on my blog! And second… now anyone who will read your comment is going to add 2 and 2 together to get 4 and some more masala to go with! (People, put a leash on your imaginations) 😛 Achchha so I used to wallow in self pity and broken-heartedness and you were laughing in your head all the while? Damn. I thought you were my baaaaaaaaast fraand! Waaaah. @Julia Scissor: 🙂 Thanks for dropping by and commenting! Haha, I love the graphic! And yes, it’s absolutely nuts how anything a crush does is always analyzed and blown outta proportion – – that too, always in favor of what we want to think versus what is actually happening. 😛 Very cute graphic. Did you ever watch the movie, ‘He’s just not that into you”. That should be the theme movie for those individuals that catch themselves over-thinking what’s essentially black and white. Wonderful comic strip… Hilarious as ever! P.S. 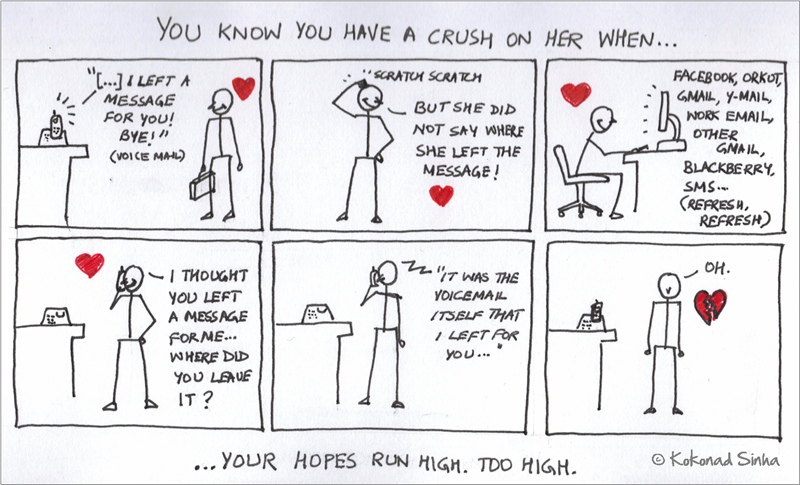 No offense to anyone taking crushes seriously! Sigh!! Gone were the days when a simple love letter did the trick! Actually I did see the movie! Did not think very highly of it, but I did enjoy Drew Barrymore’s line when she said you now need to check so many places for a message, only to be dumped – and it was exhausting. Heh heh! Thanks for dropping by and commenting! Ok, new expression based on Samir’s idea coming eventually! Thank you for the compliments! But at least for a good few months now, no more relationship related posts! 😛 People will start getting ideas! I had a couple of them drawn out – they will get published MUCH later. Welcome to my blog, Ashwathy! Thank you for commenting! I love your blog – especially the 55 Fiction! Blogrolling you. hee hee. brilliant. spot on the strip is. i loved the refresh refresh part. i’m passing the strip along to all the folks at work! cheers! Thank you, thank you. And welcome to my blog! 🙂 I loved your blog and I am blogrolling you! Haha yeah that line was a classic. I wouldn’t list the movie under my favorites – but I have definitely recommended it to one too many girls that I know who can’t seem to see what’s flat out obvious about men. Lol. Oh yeah. Several people in this world (guys too, you know) require that vigorous shake by the shoulders! Except that they wouldn’t make a movie titled “She’s just not that into you”. I could so identify with the strip. Very true and funny of course :). Heh heh! Thanks for commenting, Gauri! Which, btw, was not one of my favorite movies. I don’t think Mel Gibson should be allowed to act at all! Also, welcome to my blog! Aww! It all happens. And damn. Always in the head! And it takes so long to realize when it’s for real! LOL. Like takes time to let the reality sink in. P.S. I though I already commented on the post when I read it on Reader. Looks like that was in my head too. Sorry for the late reply! Thank you, thank you and thank you! 🙂 Thou hast been very kind! First thank you – I am glad you liked the doodle! Second thank you – For the new favicon. I am actually trying out several and seeing which ones look good! I like this one – but it’s practically illegible on black/dark backgrounds! Thank you thank thank you thank you! Sorry, me very overwhelmed! *sniff* Left you a LONG comment on your latest! Thank you Adisha! I love your blog too (blogrolled), and now I have subscribed to it! hilarious!!! loved the comic strip! that was too good ! Do you mind if I use your doodle in my blog ?? Absolutely, Rajarshi – no problems! Thank you, I am glad you liked it! If you can, can you provide a link back to this site? I would really appreciate it! Hilarious! Each of you doodle / blog leaves me with a smile! Now that Anu has opened the can of worms, am so curious! Who was she 🙂 hahaha! School days!! Hilarious! Each of the posts is leaving me with a laugh! Anu, I have a bone to pick with you. Hahaha 🙂 Surbhi.. there you go 🙂 Nice seeing/reading you too! And now I rem who she was! Uffffffffff…. she was all you could talk about! Hehehe! I sympathise with Anu! I was a crush King in my school days, up until high-school, then I got real girlfriends. Before then, every year I would develop a secret crush on one girl, one year it was a girl named Bernadette. Like you said, the amount of time spent imagining is incredible. I made the mistake of telling my sister and brother about it, who were in the same school. They swore that they were gonna tell her if I didn’t. I know they were only trying to help me but the thought of expressing my feelings for any girl is something that absolutely terrified me. Anyway, my sister bought me a rose from the florist and told me to go up to her and hand it to her. Monday morning came, I somehow gathered up the brass ones to go into school with this rose. I see her in the hallway, I am absolutely petrified and frozen, like I was bolted to the floor. I finally walk up behind her, and right as I was about to say my speech, the head of the rose broke off and fell on the ground right in front of her. That was my game right there, not bad for a 12 year old. If I had a noose right there, I would have hung myself in the hallway. Every thing that could’ve gone wrong, did. Now, years later, she is a drug addicted prostitute. I sure know how to pick ’em. Life can be without mercy at times.